While it is not possible to stabilize greenhouse gas concentrations immediately, a global commitment to reducing emissions would decrease the risks of global warming regardless of uncertainties about the response of the climate system. Scenario analyses conducted by EPA for a Report to Congress on Policy Options for Stabilizing Global Climate indicate that if no policies to limit greenhouse gas emissions are undertaken, the equivalent of a doubling of carbon dioxide would occur between 2030 and 2040, and the Earth might be committed to a global warming of 2-4�C(3-7�F) by 2025 and 3-6�C(4-10�F) by 2050. Early application of existingand emergingtechnologies designed among other things, to increase the efficiency of energy use, expand the use of non fossil energy sources, reverse deforestation, and phase out chlorofluorocarbons, could reduce the global warming commitment in 2025 by about one fourth, and the rate of climatic change during the next century by at least 60%. A global commitment to rapidly reducing greenhouse gas emissions could stabilize the concentrations of these gases by the middle of the next century, perhaps limiting global warming to less than 2�C(3�F). Forum - U.S. Energy and Environmental Policy Under President Trump: As the Federal Government Scales Back, Will States Step In? 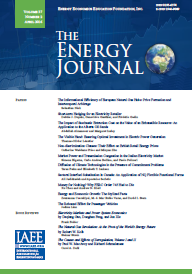 Published in Volume 12, Number 1 of The Quarterly Journal of the IAEE's Energy Economics Education Foundation.